DEAR TIM: The house I purchased five years ago has a very large treated lumber deck off the back. Just recently, I discovered spongy drywall inside my home where the deck connects to the house. Upon further inspection of the exterior, serious wood rot was discovered. The cause appears to be no flashing where the deck ledger board connects to the house. DEAR GATES: I realize you have problems, but believe me they could be much worse. 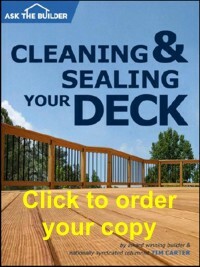 Imagine if you had not discovered the wood rot until after the deck collapsed? 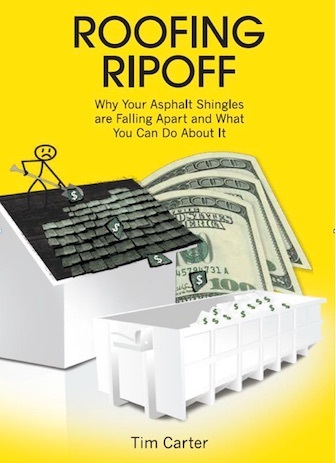 Each year, decks fall off houses and people are seriously injured or killed. The reasons for the collapses are many, but structural failures where the deck ledger board attaches to the house are commonly involved. CLICK HERE to get FREE & FAST BIDS from local deck carpenters who can make sure your deck is SAFE and will not collapse. The deck ledger board acts as a primary support beam for most decks. The board is attached to a house and the deck joists are fastened to the ledger board with special structural metal joist hangers. At the other end of the deck away from the house, the builder often places another beam under the joists or in the same plane of the deck joists. The deck ledger board at the house often carries 50 percent or slightly less of the combined weight of the deck structure, any furniture on the deck and any people who are standing, sitting or dancing on the deck. The combined weight of all of these things is often measured in tons. The good news is I doubt your deck has to be torn down. As for your options, my guess is that if ten carpenters were asked the question, you would end up with ten different solutions. But I wonder if any of the carpenters or remodelers you interview will come up with the fix I have in mind. I am tempted to permanently disconnect the deck from your home and make it freestanding. Once this separation is complete you would never know it when standing on the deck. From below, you may see two new deck support posts several inches away from your house wall. I used to attach deck ledger boards directly to houses. I took all kinds of precautions and installed flashings and caulked the holes where through bolts passed into and through the side wall of the houses. But I never felt entirely comfortable with the long-term performance of the caulk at the bolt holes. The caulk manufacturers would say the caulk lasts for 20 or even 50 years, but how does one know? Freestanding decks offer enormous peace of mind. The builder knows there are never going to be any leaks and collapse due to rot is simply not going to happen. The deck is constructed in a similar manner as a beach house is built on piers. In other words, the deck simply has four or more legs much like a table in your kitchen or dining room. There are some very important structural aspects you must consider when you build a deck in this manner. The method of connecting the deck to the posts or columns is very critical. Failure to do this in an approved manner can lead to the deck collapsing from racking or sway forces. Racking can happen when dancing people start to get a deck moving back and forth sideways. It's a real and powerful force that has contributed to the collapse of many decks. To prevent racking, residential structural engineers can recommend affordable metal connectors, special diagonal bracing under the deck and a simple yet sound design for how and where the deck posts connect to the deck beams and floor joists. 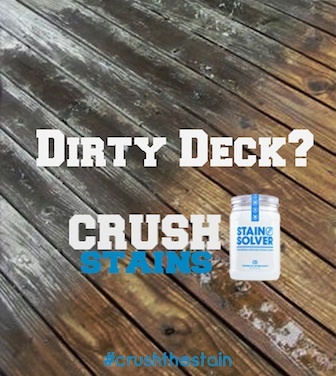 Wood deck surfaces need to be cleaned and sealed to keep them in good condition. 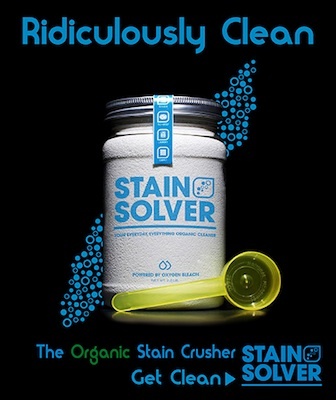 The cleaner I recommend is oxygen bleach. Your deck can possibly be retrofitted very easily if you choose to make your deck free standing. 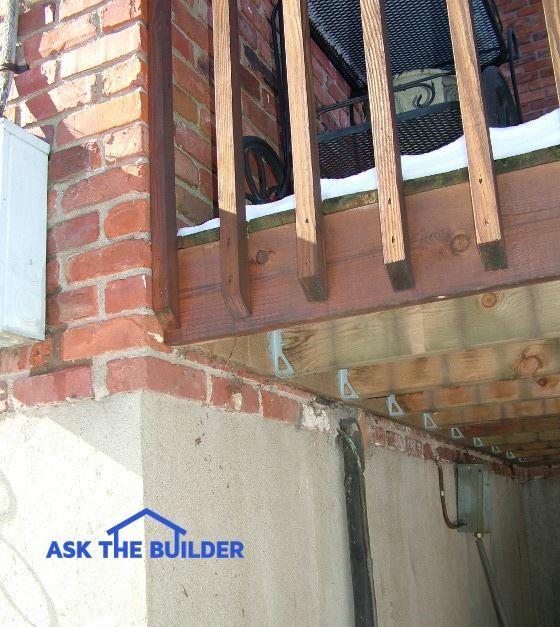 The additional support columns might be able to rest upon your existing house footer. The new beam that will replace your deck ledger board only needs to be spaced 2 inches away from the existing exterior wall of the house. This spacing is more than adequate to allow water to drain between the house and beam. The extra lumber you buy to retrofit your deck may look like the treated lumber on your existing deck, but it might contain different chemicals that can be highly corrosive to certain nails and metal framing connectors. The leading structural framing connector manufacturers sell new connectors that have extra galvanizing treatment that resists the corrosive brew of treated lumber chemicals and rainwater. Just as important are the fasteners you use to connect the lumber together and to fasten the metal connectors to the lumber. These screws, bolts and nails must also be rated to resist corrosion when in contact with the new treated lumber. You can't go wrong with stainless steel fasteners. Stainless steel will absolutely stand the test of time. The structural engineer you hire should specify the exact model number of all connectors, lumber type and the size and type of fasteners. Tim, I have a similar problem. Our deck (12' x 30') & is about 6 years old. The underside is elevated about 10' above a concrete patio. Main structure is steel post and steel I beams - wrapped in cedar w/ 16" x 16"
vertical cedar posts. Joist are 12" OC attached with galvanized hangers. Problem: 1/3 of the ledger is affected by water leaking behind and is starting as food for ants and in some spots a bit spongy.
? Can I just replace the effected area; i.e. cut ledger and replace with new ? Or does the ledger need to be one piece? This is a serious job. You need to replace the entire ledger and properly flash the entire situation. Best to detach the deck from the house and turn it into a table with four or more legs.